The upside of a recent surgery is I have to stay down for a while (and you know how I HATE that) which equates to more time for posting…. on birds hehehehe. As is the norm around here, my featured bird comes from a number of years back. To be precise, all the way back to May of 2014. I used to beat myself up more on my tremendous backlog of pictures, but the more camera enthusiasts I meet, the more I realized this is pretty common – especially for those of us holding down a primary job completely unrelated to photography. I know for a fact my brother Ron is starting to experience a growing queue as well which is especially painful for him not that his bird count has plummeted to like three thanks to initiating his new blog (see the link in the navigation bar). Of course, this means I can spend those cold winter days inside birding from my queue in the comfort of my den sipping hot chocolate – yeah! 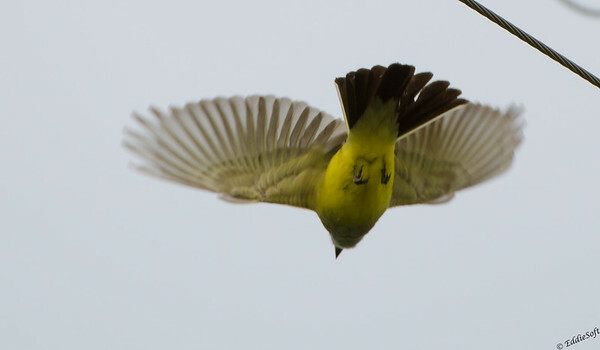 Hit the jump to see a lot more pictures of this bird … might even reveal what it is. Probably about time to comment on this lovely bird you have been looking at. This particular specimen was shot on our trip to Colorado. Linda was showing the dogs at the Agility Nationals being held outside of Denver at the Jefferson County Fairgrounds. Pretty sure Kerby and Rizzi were running that year. Kind of sad to think about that event these days having lost Kerby since then – we still miss him a lot. During the down times, me and the Beast would head out exploring what the fairgrounds had to offer. Pretty productive based on all the pictures that have been processed so far. 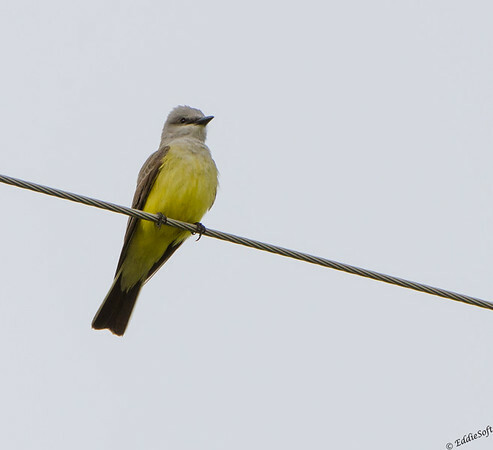 The Western Kingbird you are viewing here was a great find representing a +1 on the list. For those of you who might be in the area, this bird (and companions) were hanging out behind the horse arena up the hill from the main indoor arena. It was a bit of a hike to traverse the hill, but simply follow the dirt road that goes behind the arena and directly in front of a row of houses. These beautifully ornate Kingbirds had built a home on some utility poles and were hanging out on the wires enjoying the start of a new day. Guessing I was benefiting from their home being near a fairly congested area – especially on days where there are horse events. They pretty much could care less that the Beast was pointed in their direction to the point it seemed liked they were almost posing for the camera. That or this was the customary method for aviary to flip me off. On second thought, I might have just caught them finishing up their morning yoga routine (“sideways facing bird”). Ouch, I MUST STOP LAUGHING. Oh, and they even provided me with my signature over the shoulder viewpoint. 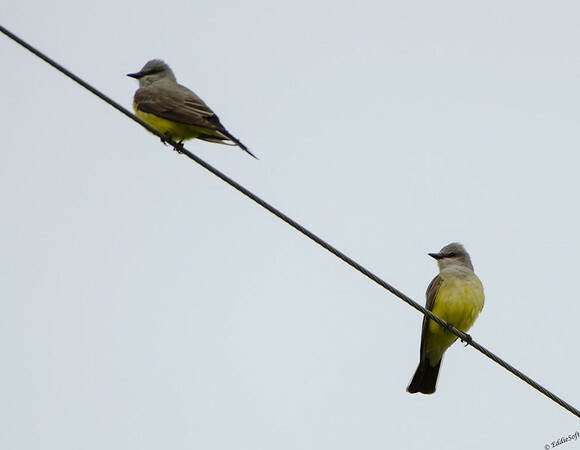 These Western Kingbirds are quite the cooperative bunch. Turns out I did not have to go all the way to Colorado to get this bird checked on my list. 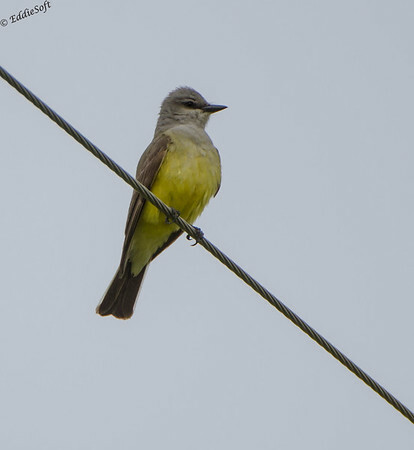 If the queue ever gets whittled down significantly you will find out that this bird was also shot hanging out at a rural intersection south of Havana, Illinois. 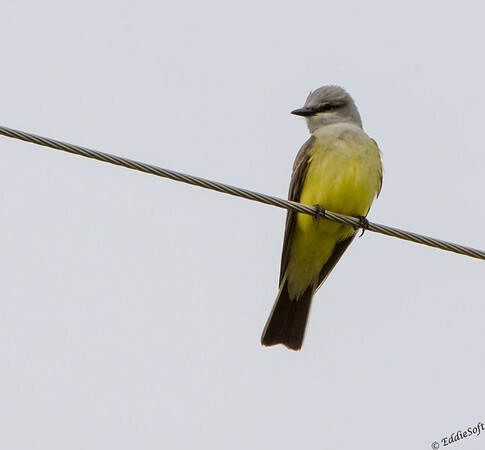 A twofer for those of us who had the opportunity to add the Scissor-Tailed Flycatcher to our list (or more accurately my queue) in the same location the last couple of years. Unfortunately, I was not able to get one spotted for Ron when we were down there – still feel bad about him coming all the way down here to get that and it not being there when we went back – he did get the Scissor-Tail so all was not lost. At the time I had forgotten this set was in the tin (these shots are probably better than the Havana shots anyway – those were a lot less skittish than the Havana specimens). About now Ron is probably tearing his hair out looking for the new bird facts. Although, as of late he has been spicing up the comments with interesting facts that my readers are quite appreciative of – especially when they get overlooked by me. 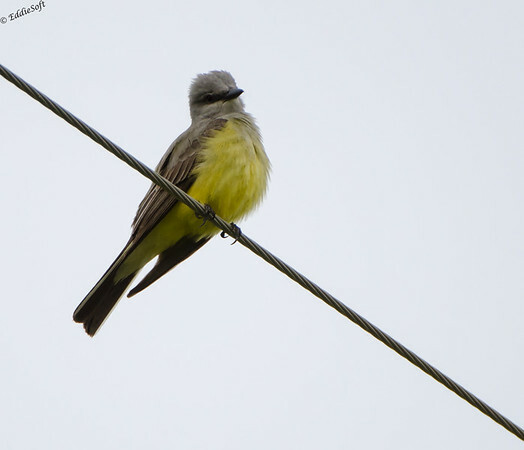 Not the case today though, got your interesting facts of the day right here…first off, Western Kingbirds like to sit on wires and look disparaging down upon flightless humans. That’s a fact, both times I have seen them they were sitting on wires looking down at me so clearly scientific proof. Now compare that to something Cornell’s site identified – going to quote them directly here “Western Kingbirds are aggressive and will scold and chase intruders (including Red-tailed Hawks and American Kestrels) with a snapping bill and flared crimson feathers they normally keep hidden under their gray crowns.” This is interesting to me in the sense, unlike the wire sitting. I have never experienced anything related to crimson feathers. I knew the Eastern’s had a red crown they kept secret, but was not aware the Western’s did. Peterson didn’t confirm that, Sibley didn’t even mention it on either bird, but Stokes does confirm the reddish patch on both birds. Both Cornell and Stokes did note that is rarely seen so and interesting characteristic I will have to be more astute to the next time I encounter these interesting birds. Also good to note they can be aggressive to intruders so better warn my brother before we go looking for one – birds are ALWAYS attacking him for some reason hehehehe – ouch crap, laughed again. All good things must come to an end and this is determined on this blog when running out of pictures to share. I hope you enjoyed this new addition to my list and hopefully you will get to experience one out in the field (if you haven’t already). The color palette on this species is very pleasing and distinctive – in fact, it just might be colorful enough for my wife to take a picture of – she is very particular about birds she is willing to take the time to photograph. Uber-pretty or she isn’t going to waste the digital bits on it (kind of elitist if you ask me). See ya’ in field, zipper neck out! Glad to hear that your neck surgery went well!! 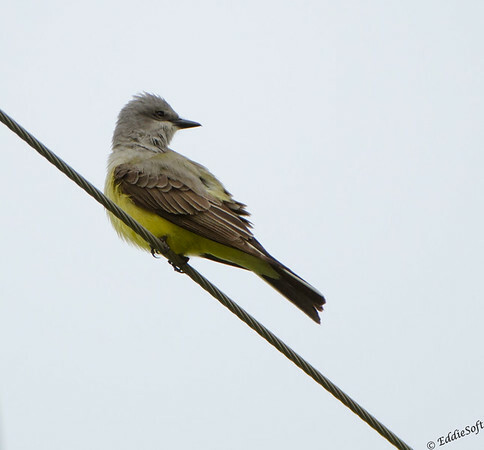 Yes, I was sad and very disheartened to see a post about the Western Kingbird, given my lack of success in finding one even though we both hunted for one at the electrical substation outside Havana, Illinois. Bad luck, but as you say the Scissor-Tailed Flycatcher and ultra-localized Eurasian Tree Sparrow were great fun to take pictures of. And we met an Audubon chapter person and a photographer, as we always do. Your pictures are great, though! I didn’t know Eastern Kingbirds, much less Western Kingbirds, had hidden red under their crown! 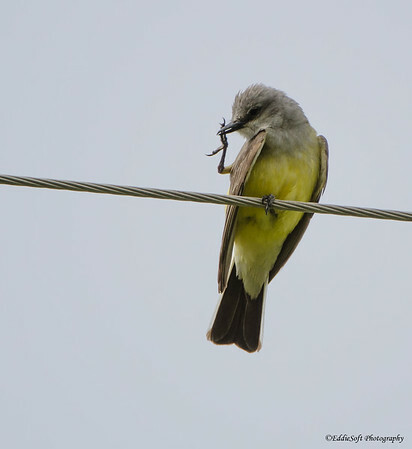 I see Eastern Kingbirds all the time, particularly at Midewin, and I’ll have to pay more attention. No problem that they only flash that when they are on attack, as that’s the normal response that birds have to me. Thanks for the cool pictures! I’ll get pictures of one this summer, for sure. All in all, not a bad outing for being in the middle of nowhere – still surprised a knowledgeable bird person actually spotted the Scissor out there (and willing to share) – I was as surprised as you were when we found out that the Eurasian was calling Havana its home. I completely forgot we met that lady while we were out there. I always get a little nervous when I’m out on an isolated shoot and someone happens upon me. Turns out she was a super nice lady and as you pointed out an active member of the Audubon chapter. That’s the problem – I wasn’t with you when I saw the Western or we would have both seen that red highlight – well, I would have seen it very clearly – you would have had difficulty being that you would likely be running for your life. We need to figure out why birds hate you so much haa!